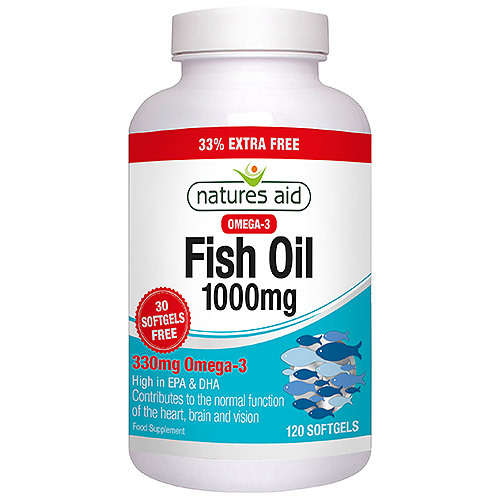 Natures Aid Omega-3 Rich Fish Oil softgels are an easy, convenient way of supplementing your diet with the important Omega-3 Fatty Acids EPA and DHA which are found in many oily fish. *% of free fatty acid content. Pure Fish Oil, Gelatin (Bovine), Glycerine, Natural Source Vitamin E prep (d-alpha Tocopherol, Soya Bean Oil). Food supplements must not be used as a substitute for a varied or balanced diet and healthy lifestyle. If you are pregnant, breastfeeding, taking any medication or have a medical condition, consult your healthcare professional before taking this product. Below are reviews of Natures Aid Fish Oil - 33% EXTRA Free 90 + 30 Softgels by bodykind customers. If you have tried this product we'd love to hear what you think so please leave a review.